A few hours ago a pirated copy of the "Smurfs 2" UHD Blu-Ray Disc appeared on the well known private torrent trackers UltraHDCLUB and IPT. The release suggests that the AACS 2.0 encryption technology used to protect these discs may have been circumvented for the first time. However, without further details, it's probably wise not to jump to conclusions too quickly. Not only are the file sizes enormous, but the protection is better than that deployed to regular content. 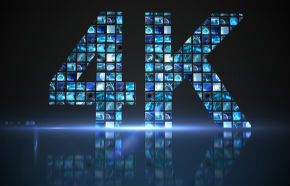 UHD Blu-Ray Discs, for example, are protected with AACS 2.0 encryption which was long believed to unbreakable. A few hours ago, however, this claim was put in doubt. Out of nowhere, a cracked copy of a UHD Blu-Ray Disc surfaced on the HD-focused BitTorrent trackers UltraHCLUB and IPT. 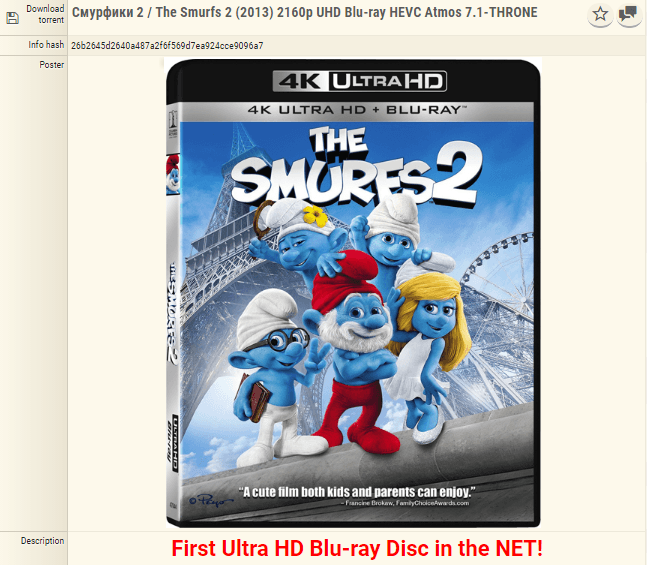 The torrent in question is a copy of the Smurfs 2 film and is tagged “The Smurfs 2 (2013) 2160p UHD Blu-ray HEVC Atmos 7.1-THRONE.” This suggests that AACS 2.0 may have been “cracked” although there are no further technical details provided at this point. Those who want to get their hands on a copy of the file have to be patient though. Provided that they have access to the private tracker, it will take a while to download the entire 53.30 GB disk. At the time of writing, there are still very few seeders available, which means that progress is slow. TorrentFreak reached out to both the uploader of the torrent and an admin at the site hoping to find out more, but thus far we have yet to hear back. From the details provided, the copy appears to be the real deal although not everyone agrees. 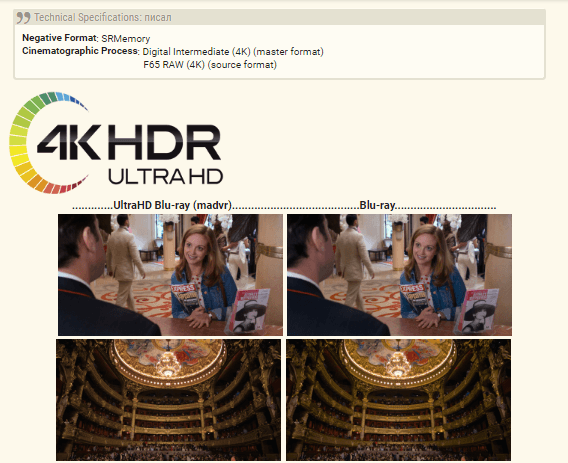 TorrentFreak spoke to an expert at a well-known torrent distribution group who reviewed the media information and compared it to the retail UHD Blu-Ray Disc. While the audio seems to match, the Maximum Content Light Level and Maximum Frame-Average Light Level listed in the media info appear to be different, and the colors in the screenshots are off too. This means that it’s warranted to remain reserved when it comes to definitive “cracked” claims at this time. The potential ‘breakthrough’ release hasn’t gone unnoticed though, and in various discussion forums people are suggesting that AACS 2.0 must have been broken. Hundreds of downloaders have jumped on the release too, congratulating the uploader. “Great job! Congratulations to the person/team who achieved this awesome milestone. I’ve got nothing but love for you!” one downloader writes. “This is history in the making and I`m proud and glad to be able to participate and experience it first hand. This is so freakin amazing and it feels sort of unreal but yet it isn`t which is the best part,” another one notes. If the encryption has indeed been broken it will be bad news for AACS, the decryption licensing outfit that controls it. The company, founded by a group of movie studios and technology partners including Warner Bros, Disney, Microsoft and Intel, has put a lot of effort into making the technology secure. If more information becomes available, we will update the article accordingly. Update: After reviewing the full file our expert source believes that the release is indeed a copied UHD Blu-Ray Disc. Whether AACS 2.0 has been broken is still unclear. Update: Updated the article to add that the releases came out on both UltraHDClUB and IPT, both claiming it as an exclusive. Update: The Chinese trackers M-Team and CHDBits also posted the torrents around the same time.